Pope Francis has reportedly sent an emotional letter to executives and the marketing team at Nike, thanking them with all his heart for “taking the heat off” him. Go here to comment. 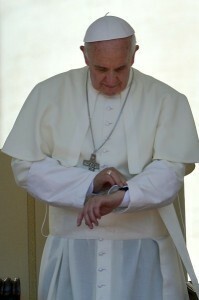 PopeWatch has been unable to confirm or deny that Pope Francis has authorized a plenary indulgence of ten years for bloggers writing stories about the Nike hiring of Colin Kaepernick. Does this mean each Catholic parish world-wide will now have to field a sports team that wears Nikes? If so, I want to be first to name our team the “Cardinals.” I hope our first game is against “the Convent Sharks” or maybe “The Penitents”? “Plenary indulgence of ten years”? Doesn’t plenary signify “absolute” or “total”? Not very lawyerly of you Don. A “partial” indulgence of ten years, perhaps?